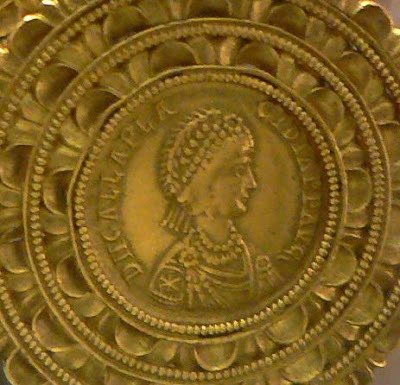 A 5th-century medallion showing what is perhaps the only portrait we have of Galla Placidia (388-450 c.e. ), the last (and the only) Western Roman Empress. The inscription says "Domina Nostra, Galla Placidia, Pia, Felix, Augusta," that is "Our Lady, Galla Placidia, Pious, Blessed and Venerable." A contemporary of such figures as Saint Augustine, Saint Patrick, Attila the Hun, and – perhaps – King Arthur, Placidia had the rare chance of being able to do something that past Roman Emperors never could do; take the Empire to its next stage which was to be, unavoidably, its demise. As I was preparing this essay on Empress Galla Placidia, I found myself giving an impromptu talk on the subject to my students in chemistry on the last lesson before Christmas. Later on, I thought that I could write my essay in the form of that talk. So, here it is. It is much expanded in comparison to what I said to my students on that occasion, but still, it maintains the essence of it. I have added headings and some figures. Now, I see from your faces that - yes - you would like to be told this story! But note that perhaps it is a subject that is not so far from chemistry as you might think. You see, civilizations can be seen as huge chemical reactions and you know that chemical reactions tend to flare up and then subside; it is what we call "chemical kinetics," you have studied that. The same happens for empires; they tend to flare up and then disappear; that's what happened to the Roman Empire, as you know. So, civilizations and chemical reactions can be studied using similar methods; it is a field of science that goes under the name of "system dynamics". In a sense, there are forces pushing people to do things just like there are forces pushing molecules to react. In chemistry, we call those forces “chemical potentials”, about people we might use the term “destiny” or "karma" or something like that. But perhaps the difference is not so great. Imagine that: outside the walls of Rome, there is a whole nation: men, women, children, horses, and cattle. Tens of thousands of people who have marched there all the way from the North: the Visigoths. They are led by their king, Alaric, and now they are besieging Rome. While the Emperor, Honorius, is hiding in Ravenna, the only barrier that keeps the Barbarians out of the city is the circle of the ancient Aurelian walls. But that cannot last forever. Without an army to defend the walls, the outcome of the siege could be only one. In August of 410, the Barbarians broke in and they sacked Rome. That date was to be remembered in history: the most powerful city in the world, the “eternal” city, had fallen. The shock generated by the event reverberated for centuries. Among other things, it inspired Augustine's "The City of God," still well known today. Edward Gibbon gives us an especially poignant report of these events in his “Decline and fall of the Roman Empire”. In the year 405 (perhaps), Europe saw a very cold winter – so cold that it froze the waters of the Rhine river. That river had been the Eastern border of the Empire for centuries. It had been chosen after that the Romans had been defeated by the Germans at Teutoburg, long before. But when it froze, a great number of Barbarians crossed over. That was the end of the border fortifications; the Romans simply couldn't defend them anymore. The walls were abandoned and left to crumble to dust forever. It was an epochal change; from then on, the Barbarians were inside the Empire and they would stay there. What I have been telling you is the history of the fall of Rome as we can read it in the texts of the chroniclers. Actually, very little is left of those events in terms of contemporary sources; most of what we have was written decades, if not centuries, after the events. So, we need to put together all the sources we have to try to understand what was exactly happening. And there is a human side to the events that goes beyond the fact that Rome was in decline and that it eventually fell. We can just barely imagine what was the atmosphere in Rome during the two years of the siege, what people thought and how they saw an event that - by all means - they must have found incredible; actually impossible. Rome had not been besieged for a thousand years, it was the greatest city in the known world. That it would fall to a petty Barbarian lord, that was.... come on. It just couldn't be! The problem is that when people face something that doesn't fit with the way they think the world should be, they tend to ignore it. If they can't, they may go crazy. And the Romans went crazy. They tried whatever they could think of. They raised a new Emperor, someone named Priscus Attalus, with all the pomp involved in the circumstances. But the Barbarian King was unimpressed. Then, they sent to him a delegation of Senators, and they told the King how numerous the Romans were. To that, Alaric answered, solemnly (I figure) “The thicker the hay, the easier it is mowed” Now, tell me if this is not the stuff legends are made of! We have a little story to tell, here. Let's go back a few years, when Placidia's father, Theodosius 1st, "The Great" was the last Roman Emperor to rule over both the Eastern and the Western part of the Empire. He had two male children, Arcadius and Honorius, to whom he left the Empire. Arcadius took the East and Honorius the West. But Theodosius had also a younger daughter, Galla Placidia, who got nothing. Then as now, being female is not an asset when it is a question of inheriting an Empire. But Theodosius may have understood that his two male children would not make good emperors (they didn't) and so he kept Placidia in reserve, sort of; something that turned out to have been a smart move. 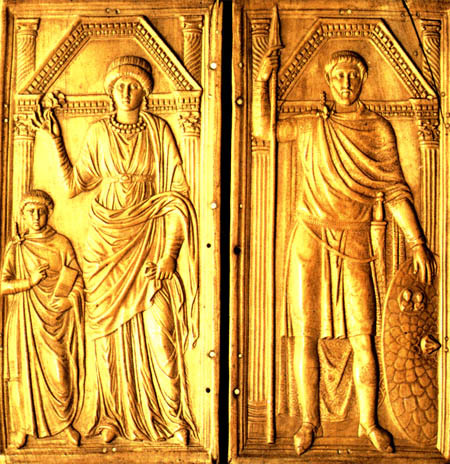 Theodosius left Placidia in the care of his best general, Flavius Stilicho, who raised her in his household, with his wife Serena who was also Theodosius' niece. We can't say, of course, what passed in Placidia's mind at that time. We can't even be sure that she actually approved anything. We know about this story only from a line written by Zosimus, a Greek who wrote more than a century after the events. But, if it did happen, it was the first political decision taken by Placidia in her life; something that may give us some idea of her way of thinking. Possibly, she simply cracked under the stress of the moment. But she may also have reasoned that opposing the Senate would have made no difference. They had already decided on that crazy idea of killing Serena, what was to stop them if they were to get even more crazy and decide to kill also Placidia? After all, she was Stilicho's foster daughter; she could have been a traitoress, too. So, maybe Placidia just didn't try to fight a battle she couldn't win. It was her style: don't fight the unavoidable. We'll see that it will resurface more than once, later on. Placidia could be flexible, adapt, and thrive even in very difficult situations. With the execution of Serena, we may imagine that the Romans expected that the Visigoths would vanish in a puff of smoke. But, of course, that didn't happen. In 410 a.d. the Visigoths broke in, they sacked Rome, and not just that: they took a very big prize: Galla Placidia herself; puella nobilissima, half-sister of the ruling emperor. The chroniclers don't mention anything like Placidia being dragged away from her palace, kicking and screaming – actually, they are totally silent on this point. Probably, that means something. We don't have to think that Placidia was happy to join the Barbarians but, again, she didn't try to avoid the unavoidable. We can't even exclude that she may have felt safer with the Barbarians than with the treacherous Roman Senators. At least, as far as we know, the Visigoths treated Galla Placidia with all the honors due to a puella nobilissima, a Roman Princess. But we do know something about Placidia's face. We can see it in some coins minted during her later reign as Empress. The problem is that these portraits are not supposed to be realistic. It is the same problem we have with Cleopatra, the Egyptian Queen. We tend to think of Cleopatra as a very beautiful woman, but we don't have a portrait that we can attribute to her for sure. So, looking at her face on coins, well, she looks frankly ugly. But, of course, those portraits on coins were just icons; not supposed to be a realistic depiction of the Queen's face. So we can happily continue imagining Cleopatra with the face of Elizabeth Taylor, who interpreted her in an old Hollywood movie. It is curious that, of those characters, the one for which we do have the most historical data, Galla Placidia, is the one who didn't generate epic poems. I feel a bit sorry for Placidia because of this, but so it goes. I think it is because civilization stymies creativity. Placidia's foster-father, Stilicho, was rich enough that he could keep a house poet, Claudian, who was a "panegyrist;" someone whose job was to sing the deeds of his masters. And Claudian did exactly that; he wrote poems praising Stilicho and the members of his family, but almost nobody remembers those poems today. As I was studying the story of Placidia, I made an honest effort to read Claudian's poems. I found that he is refined, clever, cultured, and unbelievably banal. And when I say “banal” I mean real silly. You know, Claudian looks to me as something not unlike our TV advertising: it is clever and often visually stunning but, in the end, it is just about eating hamburgers. As a note, Claudian mentions Placidia once, as a child, all clad in gold, at the imperial coronation of her half-brothers. A glimpse we have of that time, so remote that even a small detail is to be treasured as much as possible. The military situation was changing. The Romans had managed to rebuild an army under the leadership of a new commander in chief: Constantius. He seems to have been a competent general. He never fought big battles but almost always he obtained what he wanted. The Visigoths started feeling the pressure and they had to leave Southern France and move to Spain. Their retreat must have been rather hasty since they had to abandon Attalus, the usurper who had sung at Placidia's marriage. He was captured by Constantius and sent to Ravenna, where he suffered the humiliation of having a hand cut off before being sent to exile. In Spain, the Visigoths settled in Barcelona which, at that time, was a fortified stronghold. There, everything went wrong. Little Theodosius died before being one year old. Then, Athaulf was killed in a conspiracy. Maybe it was the result of the loss of prestige that he had suffered from the retreat from Southern France. Surely, there were Visigoths much more aggressive than Athaulf in the way they thought they should deal with the Romans; there may well have been something like a “war party”. The new king was one of them. He was named Sigeric and, just to give some idea of what he had in mind, let me tell you that he forced Placidia to march for miles on foot, while following her, riding his horse. Fortunately, as I said, she was strong and in good health. But Sigeric ruled for just one week; I think that the Goths were afraid of what he was planning to do – and correctly so. As I said, the Romans were now much stronger than they had been at the time of the siege of Rome. So, someone got rid of Sigeric and a new, more diplomatic king was installed - someone named Wallia. The new king started negotiations with Constantius and, eventually, he sent Placidia back to Ravenna in exchange for food and a peace treaty. That was the end of Placidia's time with the Goths. For all her life, she maintained the title of “Queen of the Goths,” but she would never be with them again. The story of Galla Placidia seems to have been conceived from the beginning as the plot of an adventure movie. It is full of events and it swings up an down like a rollercoaster. So, we saw that Placidia started as a princess, then she was prisoner of the Goths, then she became their Queen, then she was again their prisoner. 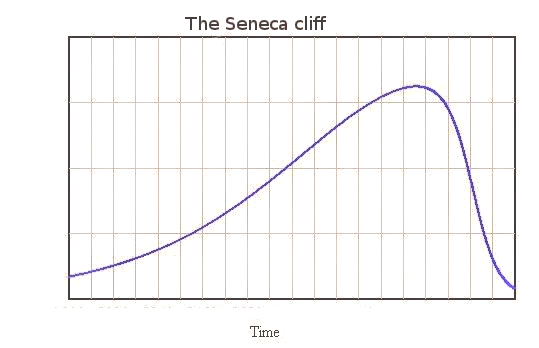 A series of oscillations that was to go on for quite some time. With Placidia back to Ravenna, things changed again. It seems that Constantius had something in mind about her; actually, he may have been an early suitor of hers. Anyway, the two got married soon after arriving in Ravenna. We can't say whether Placidia was happy about that but, as usual, she didn't fight the unavoidable and she followed opportunities when she saw one. The couple had two children and, later on, Constantius, as the husband of a member of the Imperial family, managed to be raised to the title of “co-emperor” of the Western Empire. At this point, Placidia obtained the title of "Augusta." It was not exactly the same title as “Imperator” which means “commander” and has to do with leading armies. But, for all practical purposes, she was Empress of Rome. You see? A big swing upward of the rollercoaster. Now, there is a lot to say about Placidia's life as Empress and the rollercoaster was to go through a few more swings up and down. But let me go quickly with the story because, as you perhaps have heard, “the art of boredom consists in telling everything.” So, Constantius died a few months after having been raised to the Imperial Purple and the situation in Ravenna evolved into a squabble where Honorius and Placidia, Emperor and Empress, started behaving like the characters of old western movies; you know, when they say, "this town ain't big enough for both of us." And here we have another swing down of the rollercoaster. 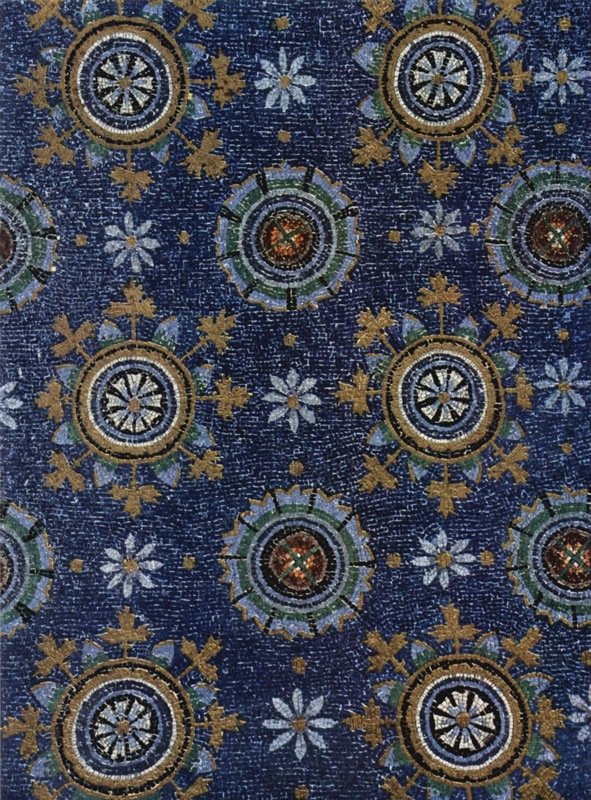 Placidia, thrown out of Ravenna, could only take refuge in Constantinople; the capital of the Eastern Empire. There, her nephew had become Emperor with the name of Theodosius II. Placidia arrived in front of him with little more than the clothes she had on. But the rollercoaster swung up again: while Placidia was there, Honorius died and a usurper took his place. At this point, Theodosius II thought that he couldn't lose the Western Empire to his dynasty; so he gave to Placidia a whole army to go back to Italy and reconquer Ravenna. It was bad for the usurper; the poor guy didn't have a chance. He was defeated, captured, had one hand cut off, then he was paraded around on a donkey, and finally beheaded. We don't know if Placidia ordered all that herself, but those were hard times and if you wanted to be an emperor (or an empress) you had to take the risks involved. No one ever said that Placidia was Ms. Nice Girl, anyway. Now, let's play a little game, a game that I think all of us have played inside our minds. If you were the absolute ruler of the world, the Emperor of Earth, what would you do to solve the world's problems? I am sure you have plenty of ideas that you would put into practice; you know, how to eliminate hunger, reduce pollution, stop global warming, make everyone happy - all that. Of course, that is only a dream for us, but there have been people in the past who really had tremendous power in their hands. Not on the whole world, of course, no single person has ever ruled it. But there existed people who ruled sizable parts of the world and their power was absolute and subjected to no rules. The Roman Emperors of the last period of the Empire were of that kind. They were called porphyrogeniti, “born in the purple,” they were semi-divine rulers. You know, if you were emperor at that time, you couldn't turn your head left or right when you walked; your subjects could speak to you only if you addressed them first, you had to wear heavy clothes all the time, and God knows what else the imperial protocol would impose on you. There is a curious detail about Constantius, Placidia's second husband, who said that becoming Emperor had been a terrible experience for him: too much protocol! That was the price of absolute power. Actually, “absolute power” is an exaggeration. Galla Placidia, as any emperor before and after her, had limits to what she could do. One of these limits was that she couldn't lead armies herself. She had to rely on generals and that was a big problem: as it always happens in history, successful generals tend to take all the power for themselves and, of course, unsuccessful generals are totally useless. So, during her career as Empress, Placidia's main problem was to control her generals by balancing one against the other. One of these generals was named Aetius, you may have heard the name. He was quite a character, he was a Roman but he had been raised with the Huns, so they were his allies and they would fight for him when he needed (not that he didn't need to pay them, though). But Aetius was also the general who led the army that stopped Attila the Hun from invading Europe at the famous Battle of Chalons, in 452 AD. So, Aetius and Placidia were often at odds but, on the whole, they managed to get along together. After that Placidia was gone, her son, Valentinian, killed Aetius, repeating the mistake that Honorius had done earlier on with Stilicho. Again, by killing his best general, Valentinian nearly destroyed the empire. But that's another story. Managing any large structure is difficult and we tend to do it badly; a whole empire may be an especially difficult case. To do it well, we would need to use a method that I mentioned before: system dynamics; which is a way to describe systems and the relation of the various elements that compose them. But it is rare that people can understand systems in this way. What happens instead is that, in most cases, we understand what are the critical points ("levers") that are causing troubles, but we tend to act on them in the wrong way. It is something that we learned in our times from Donella Meadows (like Placidia, a strong woman, although not an Empress) who has taught us a lot about system dynamics. It is a very general trend: almost always we pull the levers in the wrong direction and we worsen the problems that we are trying to solve. That is even too clear for the case of the Roman Empire, at least from our viewpoint. During the decline phase, Roman Emperors struggled to keep the Empire safe from Barbarian invasions and they understood that their problem was that they didn't have enough resources to do that. But their answer was always the wrong one: they kept trying to raise as many troops as they could. 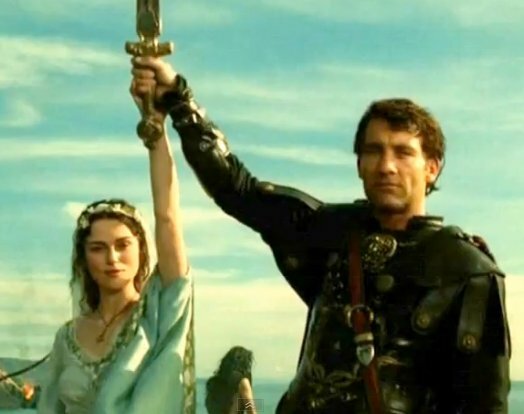 That was a self-defeating idea: every time that the Romans fought the Barbarians, they could win or lose, but each battle made the Empire a little poorer and a little weaker. The empire was using resources that could not be replaced; non-renewable resources, as we would say today. So, wasn't there a solution to the troubles of the Roman Empire? Well, there was one if you think in terms of system dynamics. It is a question of pulling the levers in the right direction. By raising troops and fighting battles, the Roman Emperors were pulling the levers in the wrong direction. They had to invert the direction: the solution was not more troops but fewer troops. It was not more imperial bureaucracy but less, not more of a tax burden but less. In the end, the solution was right there and it was simple: it was Middle Ages. What Placidia could do as an Empress was, mainly, to enact laws. The Empire still had a functioning bureaucracy and so the edicts from Ravenna were not ignored, at least in the regions that the Empire could still control. So, the law was the playground of Placidia and she did enact a number of laws, many of which are still existing in the “Codex Theodosianus,” a collection of laws compiled on behalf of Placidia's nephew, the Emperor of the East, Theodosius the 2nd. The Codex Theodosianus is an unbelievable mass of data; there are some 2500 laws in it. Well worth giving a look, because it is full of hints and glimpses of what was life in the Roman Empire at that time. But it is impossible to go into any depth in it unless you are a specialist in this matter – it is just too much. So, I learned about Placidia's laws mainly from the report written by Stewart Oost, who wrote her biography in 1966. If the purpose of Placidia really was to take the Empire to the Middle Ages, we can say that she was successful. After that she was gone, the Empire melted away. Her son, Valentinian managed to get killed a few years after the death of her mother. Then, Rome was sacked by the Vandals and that was a deadly blow. 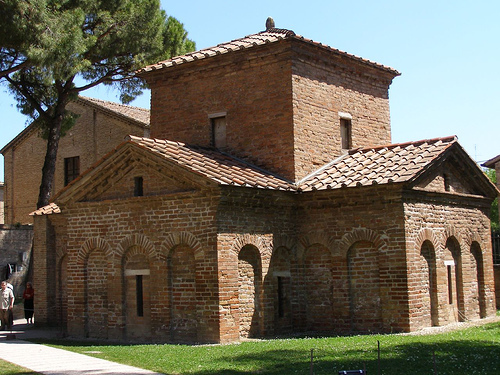 For a few decades, there were still individuals in Ravenna who claimed the title of Western Emperor, but we don't care much about their names just as, probably their contemporaries did not. We only remember the name of the last Emperor, Romulus Augustulus, who was deposed in 476, and that is just because he was the last. After that, it was officially Middle Ages – the destination where the Western Empire was going in any case. This is just a possible interpretation of what Placidia did and I am the first to say that it is just speculation. These laws may have been enacted simply because the Imperial Court was forced to, or it had no other choices. And, of course, we will never know what passed in Placidia's mind. She left us only some letters that miraculously survived in the Vatican's archives, but nothing that we could use to penetrate her inner thoughts. We can only say that staying with the Goths, although for just a few years, could have opened her mind enough that she could have a vision that no Emperor, before or after her, could have. And so she did something that no emperor, before or after her, could do. Push the empire towards its destiny, fulfilling its chemical potential, if you like. In a way, Placidia was the catalyzer that made it happen. Now, I'll ask you another little feat of imagination. Close your eyes again for a moment and imagine something that took place a long, long time ago; 15 centuries before our time. Imagine a young princess. Imagine that she has lived all of her life inside beautiful palaces; that she has been wearing splendid dresses and expensive jewels, that she has been walking inside closed gardens, rich of statuary and fountains; always protected, always secluded, as it is the usual lot of princesses. And then imagine her in a completely different situation: she is somewhere in the mountains; around her, the slow, winding column of wagons has stopped. The nation of the Goths has stopped for the night. It is a cold night of an early winter and the women have lit campfires while the warriors are sitting around, singing their songs. These tall warriors are Christian, but they are Arians, while the Princess is Catholic, and that makes a lot of difference. Then, there is more. It is likely that in one of those wagons they still carry the wooden statues of their pagan gods: perhaps Hertha the goddess of earth, and perhaps other gods of fire and thunder. Maybe, the prayers being recited for these ancient divinities can be heard as a distant whispering in the night. Placidia listens to these distant songs and then she looks at the stars as she has never seen them. These are the same stars that we can see today; dimly, because we have dirtied our sky with our waste. But Placidia sees those stars in a sky of clarity that today we can’t even imagine; the sky of a world that was shrinking to nearly nothing, its cities depopulated, its roads abandoned, its farmland left to transform into a forest. Just during those years, Rutilius Namatianus gave us an unforgettable image of the lights of Rome in the night, lights that he saw for the last time as he was abandoning the city, to seek refuge in Gallia. But, around Placidia, there was no human light, except the fires lighted by the Visigoths, and so she could see that fantastic sky. Now, of course, this is just fantasy, but I am mentioning to you stars for a reason. You see, I said that Placidia left us almost nothing in terms of written worlds. At least nothing that we can use to understand what she thought. But she left us a message that is perhaps even clearer than a written diary. 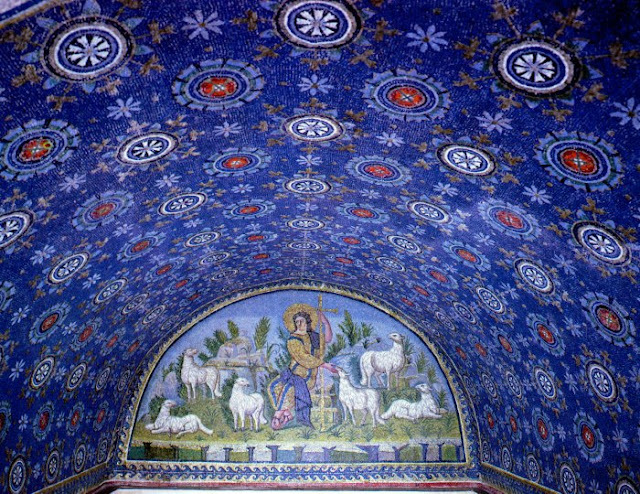 It is the mausoleum that takes her name in Ravenna, and it is there that you can find a triumph of stars in the mosaics of the ceiling. Big, bright, fantastic stars that remind to us a little those that Vincent van Gogh painted in that famous painting of his. 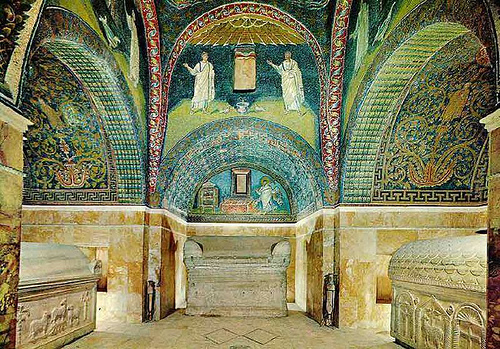 You know, those stars in Placidia's mausoleum always reminded to me of "Christmas", in the sense of the way we celebrate it today. Not, of course, the commercial holiday that it has become nowadays, but the atmosphere of the "nativity scene" that is still commonplace in Southern Europe and South America. Of course, in the mausoleum, you won't find the baby Jesus and not even the Virgin Mary. These figures would become commonplace much later. At the time of Galla Placidia, Christianity was something different than it is for us. 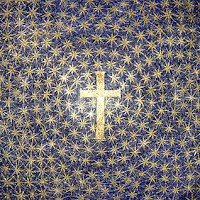 But there is no doubt that Placidia was a convinced Christian; she was a believer and she always saw Christianity as an important part of her life. The mausoleum is just part of this attitude of hers. I told you that the art of boredom consists in telling everything so I won't tell you the details of the decoration of the building and how each detail fits so well with Placidia’s story. I'll let you just imagine that and, if one day you'll have a chance to go there and visit that mausoleum; do it in silence and listen. It is a faint, faint voice, but you can hear it if you pay attention. After all, a Latin poet who lived centuries before Placidia, Terence, said that "nothing human is alien to us." Placidia was one of us. In her 62 years of life, Placidia was princess, queen, and empress. She did reasonably well in these roles and, during her reign as Empress, the Western Empire remained relatively safe and the Romans had the food they needed. She had defects; for sure. She failed to save her foster mother from death when, perhaps, she had a chance to do that. She was ruthless with her enemies and her way of being Christian may have veered on the verge of bigotry. 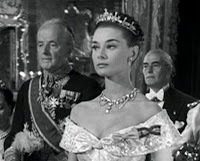 But she played her role as well as she could in those difficult times and she may have played a fundamental role in closing an era in which the very concept of “Roman Empire” had become anachronistic. A judgment by a later chronicler, Cassiodorus, may say it all about her rule, "too much peace," even though it was intended as a criticism. In the end, she was a human being like all of us and she followed her destiny, her chemical potential, if you like. should be "fifteen hundred years ago"
I just wish you had been one of my chem professors at Berkeley in 1968! Oops... geological times instead of historical times. Thanks for the correction, Pierluigi. 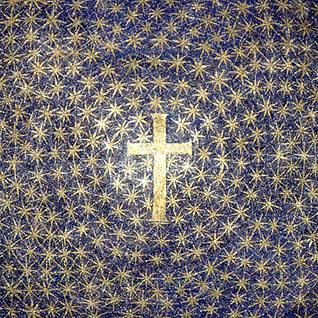 I live in Ravenna and I studied this story more than 40 years ago, when i was a child. After the last lesson the teacher guided all the scholars to visit the "Mausoleo di Galla Placidia" by walking. Thank you for reminded those times. Ow.... sorry for not responding to comments. I have been fighting with a new laptop and, so far, I am the loser! 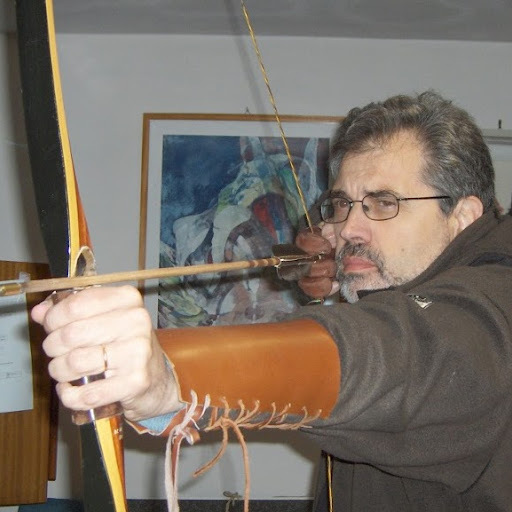 But it is a tough fight - I think in the end I'll tame it - hopefully..
@Phil, about your question, the chroniclers say that during the 408-410 siege, Rome ran out of food very soon. Famine and pestilence followed. We have no quantitative data on this issue, nor on the Roman population at the time. What we know is that Rome depended on a long supply chain from North Africa. Lack of resilience kills and this is a lesson that we haven't learned at all. Thank you Ugo for a brilliant article. Enlightening. This insight makes me see the end of Rome as a logical process of re-ordering, not just as some chaotic breakdown. It completely upsets my previous assumptions, which is a good thing. Really enjoyed your story. Certainly made me wonder a bit. Although whatever happened to the Dark Ages? Thank you very much, Ugo, for a profound and fascinating post and beautiful photos. 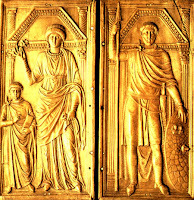 I was seeking info about Galla Placidia for my post in a brand new blog santatatiana.blogspot.com. I'll make reference to your blog in the above-mentioned post. Thank you very much, Ugo, for visiting my blog! Unfortunately, I am no longer a student. I am somebody like you. I am a professor of economics in the University of Moscow and I manage few blogs, too. But I contrive to live half a year in Italy! I like your other blogs too. I've subscribed to all of them. Sorry for writing that in comments, since I didn't found another means of communication! You can unmoderate that. Grazie mille! I have got a lot of questions to ask Italian intellectual elite about. I won't miss a lucky chance to communicate! Just finished reading "Noblissima", Placidia's story. Assume Mediolanum is Milan, little else has changed. 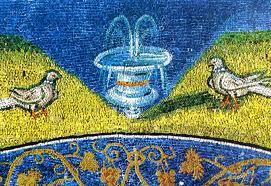 Wonderful, wonderful mosaics - lasted longer than paint and statues. Alot in European politics hasn't changed -the German tribes were the last to surrender to Caesar, the last to surrender to Charlemagne and their ideas started two world wars. The Italians are still squabbling over nothing and enjoying it immensley. Glad the USA is out of all that now tho we have our own problems. Awesome article. Doubt you are still around but as a fellow amateur historian I date the end of the middle ages and beginning of the Renaissance on the very day the water utilities were turned back on in Rome some time in the 11th century I believe. Any comments if you are still around? Oh, yes, I am still around. But I have moved most of my posts on Roman history in my blog "Chimeras": http://chimeramyth.blogspot.it/. Maybe you'll find it interesting. About water turned back on in Rome in the 11th century; I didn't know. Do you have a reference?